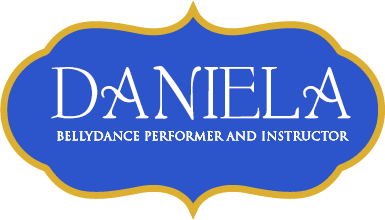 ​aniela offers many classes at all levels. Please see below to read the class descriptions and see which class is right for you. ​Classes are $10 each or $90 for a 10 class card. All are welcome! Difficulty level will be adjusted depending on the level of students present. Areas covered include basic isolations, choreography drills, basic footwork and arm positions, and an introduction to veil technique. All levels of dancers are encouraged to attend the beginner level class, as continued practice of the basics of bellydance is always recommended! Empahsis on choreography and technique. More complex choreography will be taught, as well as more complex veil technique. Also taught will be an introduction to zills (finger cymbals) and floorwork. While it is not necessary to master the basics to attend this class it is strongly recommended that you are comfortable with the basic isolations taught in the beginner and open level classes and with basic choreography before taking the intermediate class. This is a fast-paced bellydance class, with the emphasis on fitness and movement. While proper technique is taught and drilled in the “cardio belly” classes, technique is not the focus. This is also an open level class, as the level of difficulty will be adjusted depending on the level of students present.